The farmer’s job of poring over satellite field maps looking for disease, weed and insect trouble is about to go automatic. 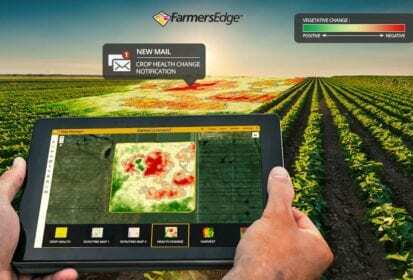 Winnipeg-based digital ag consulting firm Farmers Edge recently released Health Change Maps and Notifications, a new function that automatically scans the company’s daily satellite imagery and alerts growers of any changes in field health or spots where the field’s condition departs from the norm. With new satellite images available daily at a three-metre resolution, and the system on an “aggressive” setting, the grower can pick up “fairly subtle” changes that wouldn’t be quickly detected at a 10-metre resolution or through images delivered less often, Jamie Denbow, global digital ag lead for Farmers Edge, said in an interview. On average, Farmers Edge said, growers spend three to six minutes per field checking imagery. With the Health Change Maps function, however, the Farmers Edge platform instead identifies areas of alert and informs the grower with automatic notifications. The new tool’s algorithms, proprietary to the company, spot significant changes in the satellite imagery and automatically trigger notifications outlining positive or negative vegetative changes in the field, delivered to the grower by email. In those notifications, a grower is directed to Map Manager in the company’s FarmCommand farm management platform to view the Health Change Map and the exact locations and details of the change. The system offers both “positive” and “negative” alerts to growers; for example, a “positive” alert where vegetative growth exceeds the rest of the field would show a double-seeded spot or an emerging weed problem earlier in the season, while a “negative” alert, later in the season, would show spots where growth isn’t keeping up with the rest of the field. A crop scout can then head directly to the flagged area, Denbow said, rather than wander the field in a ‘W’ pattern scouting for problems that may or may not exist. For example, he said, the notifications recently given to crop scouts in Brazil using the system helped them detect emerging weed patches and outbreaks of cutworm. Brazil is the only area with active growing crops right now where Farmers Edge clients are using the system, he said, but noted it’s been beta-tested throughout the world, including in the Canadian Prairie provinces and Ontario and in the U.S. Midwest, as well as in Australia and Russia. Growers get the option to set the notification parameters at “aggressive” or “conservative” levels, and can also add other users and field service providers to receive notifications, Farmers Edge said. From user feedback, Denbow said, the “aggressive” setting is expected to be the preferred option, whereas growers with field under irrigation or at a less time-sensitive stage might instead opt for “conservative” mode. The system also gives growers a better idea of the geographic scope of problems such as hail or excessive rain, he said, which would be helpful when dealing with crop insurance adjusters. Given time and machine-learning, he said, such a system might also be able to help detect the more specific nature of the problem, not just alerting growers that a problem exists. For now, the system can be set to ignore unavoidable issues on a given patch of land, such as sand ridges or low spots, so a grower wouldn’t receive notifications about issues on those spots for a set period of time. Over subsequent years of use, he said, the data gathered will help improve the system’s understanding of each field.